Last summer we picked up a book at an antique store on the coast. I’m normally not a train fanatic, but this one happened to have a photos of the Crooked River high bridge on the cover, looking towards Jefferson – so, if our house had been built fifty-odd years ago, it would have been in this picture. We thought it worthy of the $8 price tag. The book is Spokane, Portland and Seattle Railway by Charles and Dorothy Wood. It covers not only the major lines throughout the west, but also our own little railway line here in Central Oregon, the Oregon Trunk Line. A time schedule from 1912 shows many town names lost to history. Nena? Nathan? Maybe they were just stopping at people’s houses. Of course, it was 1900, EVERYONE had trains, this is so NOT news. Oh, but au contraire mon frere, what we had here was a knock-down, no-holds-barred, spy-vs.-spy, fight to the finish line between two different companies. Two giants emerged on the scene to do battle for Oregon’s train spoils – James Jerome Hill and Edward Henry Harriman. Harriman was born on Long Island in 1848, and became a boy wonder on Wall Street. He persuaded his father-in-law, president of the Ogdensburg & Lake Champlain Railroad, to let him reorganize and improve the property. A dozen fruitful years later, he joined with a syndicate to purchase the Union Pacific, turning it from receivership to one of the best railroads in the country using the proceeds of smaller lines he purchased and sucked dry, then cast aside after their stockholder were ruined. Hill was born in Ontario Canada in 1835. After working as a clerk then forwarding agent for a steamship line, he created the Red River Transportation Company, which was direct competition to theHudson’s Bay Company in the area. During the panic of 1873, Hill was able to take over a bankrupt line fromSt.PaultoManitoba. Later he bought a Dakota company that held paper for thousands of acres of land. 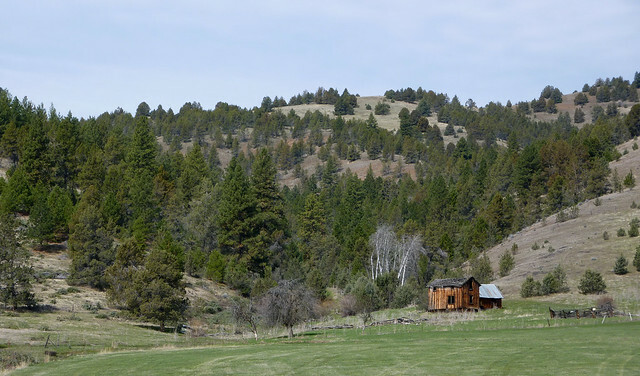 Land that had been homesteaded by many settlers for over 20 years, and instead of forcing the homesteaders to move, the government passed an act to allow Hill to trade these lands for valuable timber land in Montana, Idaho and Washington. His friend and neighbor, Frederich Weyerhaeuser helped him survey the land and purchased a few thousand acres for himself. In 1889, Hill organized the Great Northern Railway Company. The company sneaked into ownership of the Northern Pacific by purchasing shares under different names, then consolidating all into what became known as the Hill Lines. These were the two men, backed by massive capital and land, who came to Central Oregon in the 1890’s ready to build tracks, haul lumber, and make money. While both Harriman and Hill were willing to accept the business of Central Oregon, that business alone was not worth the effort and expense of constructing a railroad. Before the train came to town, Bend was overrun by donkeys. Okay, maybe not, but travel wasn’t very easy, especially in winter months. 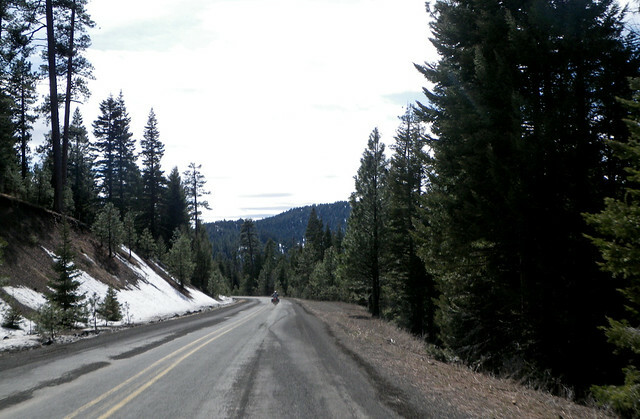 The name of the game was power, the control of transportation, and Hill, with a foothold now in Oregon, was determined to reach California. He sent John F. Stevens, one of the best known engineers in America, to the Deschutes with fishing gear in the guise of an affable sportsman. Another man was sent to buy up options on ranches and unfenced wild lands. 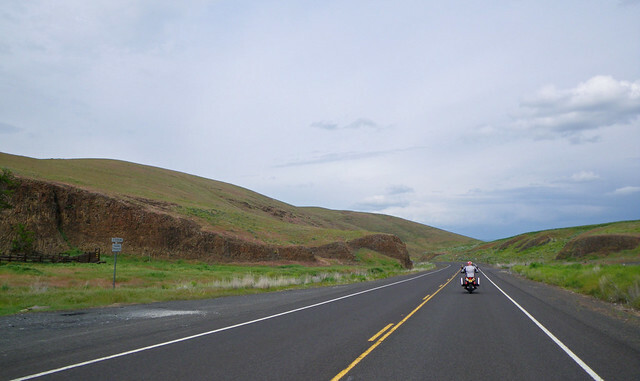 The resulting survey showed the Hill line traveling along the Columbia from the Dalles, to the mouth of the Deschutes and up Willow Creek to Madras. Harriman quickly took up the challenge also, and made his move to prevent Hill’s entry by chartering the DesChutes Railroad in 1909. 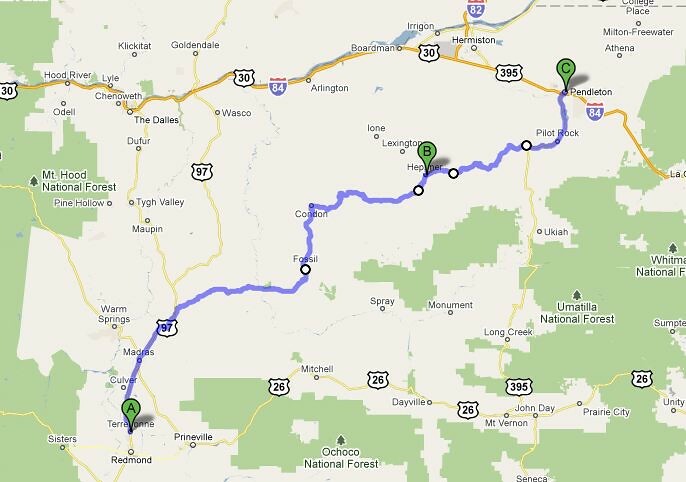 Surveyors soon filed maps for a route up the Deschutes and Trout Creek to the plateau near Madras, although some changes were made in this route when the construction was started. 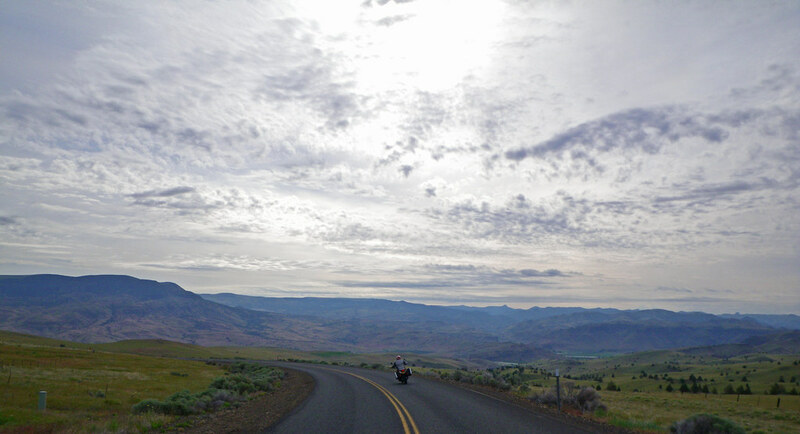 In July, without waiting for the courts to settle the issues, Harriman quietly moved in large amounts of supplies and a great number of laborers to Dalles via the OR&N, and rushed them to the Deschutes Canyon to seize the strategic points. The Twohy Brothers were contractors for Harriman, the Porter Brothers for Hill. Within days more than a thousand men and twenty different contractors were at work under the Porter Brothers, who started construction shortly before midnight July 26, 1909. The Oregon Trunk Line Incorporated, responsible for the grading and terminal work from the Columbia River to Madras, acquired the Central Oregon Railroad Company by stock purchase August 24, 1909, thus obtaining the vital site for the railroad crossing of the Crooked River, and blocking Harriman from building a parallel line to Bend. The American public was vitally interested in the accounts of the two greatest railroad figures of all time engaged in a dramatic canyon war, the last rail battle it turned out, to be fought along the right of way. It was also the last big job to be done by hand. 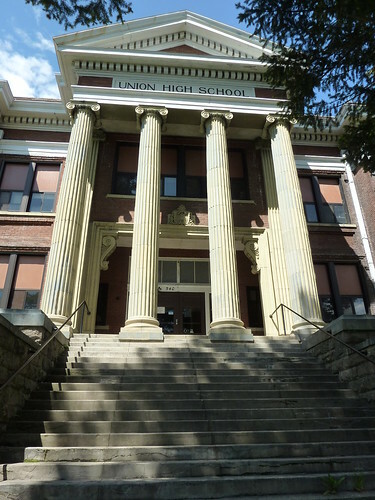 The job involved thousands of laborers, mostly recruited from Portland and Spokane. Labor was in great demand and men were hard to hold. Common laborers received 20c to 30c an hour, carpenters and concrete men, 30c to 40c, while well drillers drew $7 per day and teamsters $6. Lodging was furnished, with meals costing 25c to 30c. It was rugged country – even food had to be carried better than 100 miles overland. 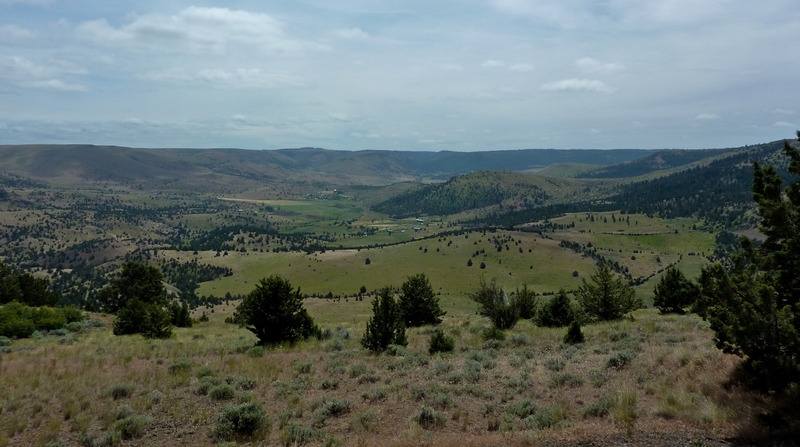 Men, supplies and equipment were brought via the Shaniko branch of the OR&N or by the Great Southern from Dalles to Dufur, then followed almost 25 miles of mountain wagon roads to points along the first 70 miles of grade upstream from the Columbia. Harriman had the slight edge with control of the Columbia Southern, but Hill also ferried supplies across the Columbia. When they weren’t trying to kill each other, the workers threw down sticks of wood and laid pieces of metal on top. This job was made more difficult by the dangerous equipment, rugged terrain, and erratic weather. If it’s not one thing, it’s another. The workers fought not only the heat, the snakes and hard rock formations that had to be blasted out by hand, but each other as well. Shovels, pickhandles, crowbars, rocks and guns were weapons as well as fences, barricades, guile, trickery and court orders. 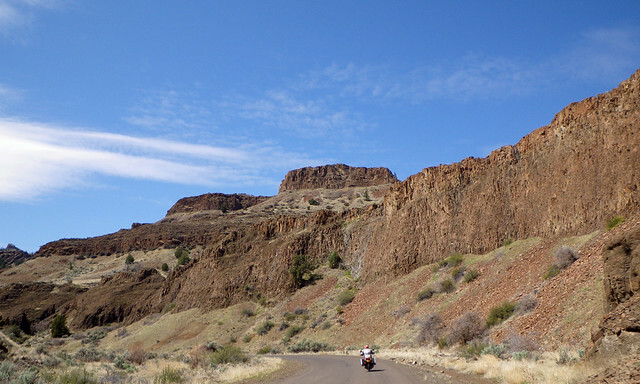 Black powder was placed in “coyote holes” drilled in lava cliffs to tear away the sheer walls of the gorge, and shortages occurred and delays ensued as powder caches were blown up by the rival side. Dynamite was set off at strategic points in the narrow canyon, and teamsters were drugged, made drunk or dragged from their wagons as they transported supplies over the rough terrain. There were running battles between huge gangs across the river from each other, using any weapon handy. Men were maimed and killed. There were constant mix ups of titles, surveys and court orders. At the very start of the construction the Twohy Brothers woke up to find that the Porter Brothers had purchased the land on which they had spent $8,000 to build a wagon road to haul supplies from Grass Valley. Now not only did the Harriman forces not have a wagon road, but their enemies did. These people live in homes with no running water, their toilet is a hole in the ground, and they are dressed nicer than many “modern” Central Oregonians on their wedding day. The Porter Brothers also bought the property on which was located the spring providing the entire water supply used by the Harriman forces. A fake telegram was sent to George W. Boschke, Harriman’s leader and the builder of the famous sea wall at Galveston, instructing him to come at once as the wall had broken. He knew that he had built the wall to last and threw the message away. 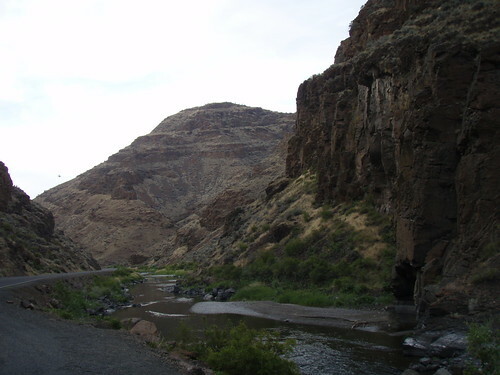 The various conflicts on the routing of the two lines between the Columbia and the Warm Springs Indian Reservation were resolved by the agreement of the DesChutes to hold to the east side of the Deschutes River and the Oregon Trunk to remain on the west side of the river. 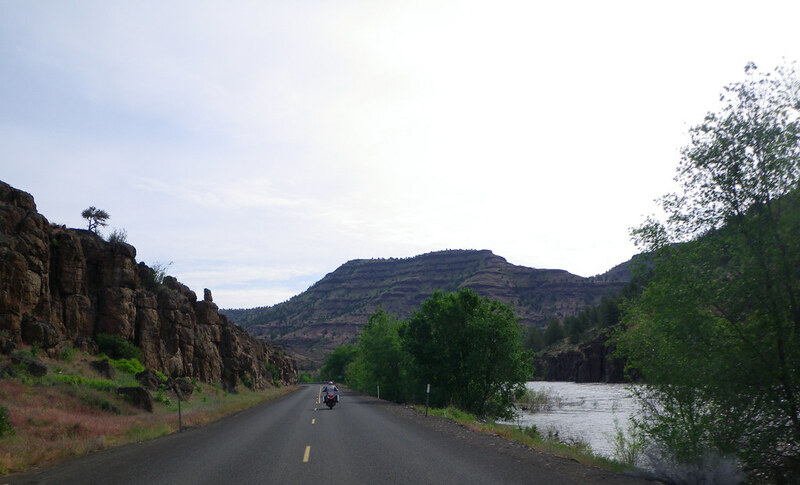 At mile 75, however, the Oregon Trunk crossed the river to avoid the delay attendant in seeking permission for a survey on the reservation and filing the maps for approval of construction. 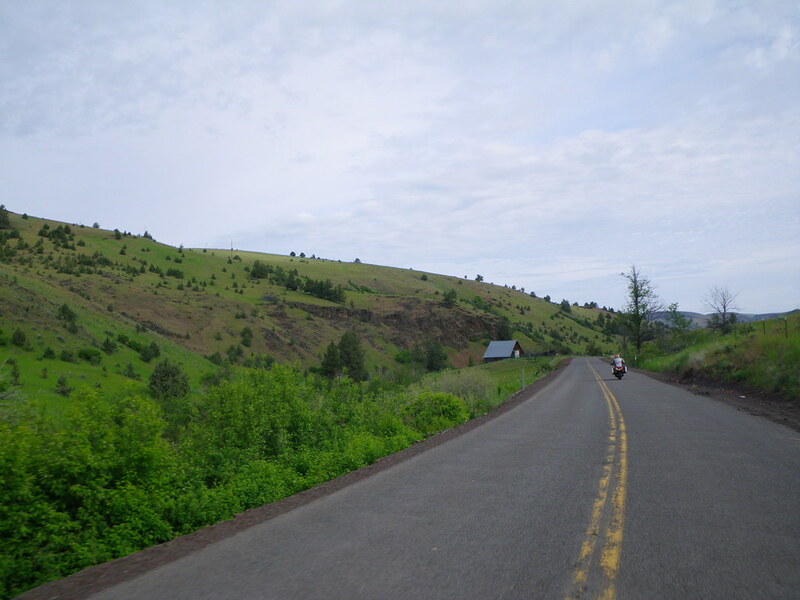 Their filing on the east side for the twelve miles south to Trout Creek predated the filing made by the DesChutes line, and the latter was then faced with the delay. Welcome to Madras! We still have dust, and rocks. But we’ve got a car and a train station, things are looking up! 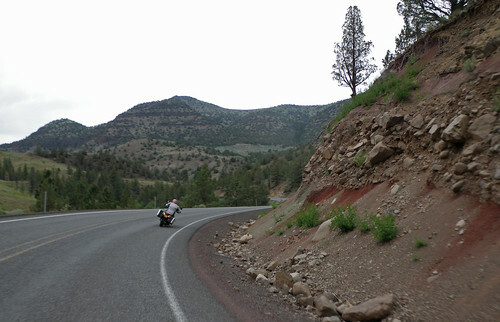 The Oregon Trunk built their grade across the survey line of the DesChutes, blocking them out and causing the government to enforce the Canyon Act providing for joint usage of the ten miles of track between North and South Junction. 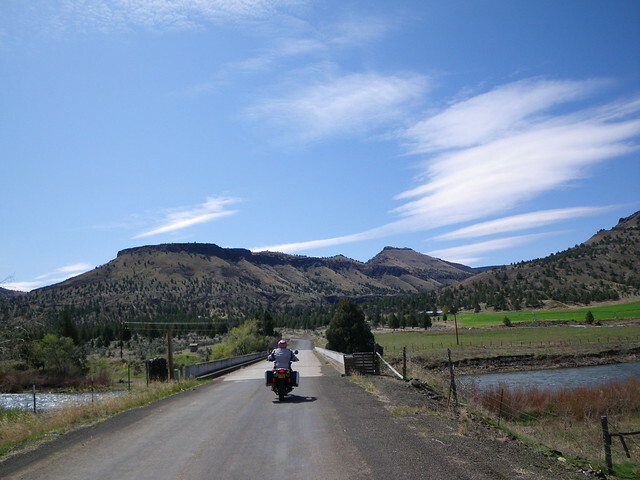 Just south of this river crossing was the Smith ranch, over which passed the only right of way to Bend. The Oregon Trunk maps had been approved by Washington before Smith secured title to the land, but he had filed on it while approval of the maps was still under consideration, and the courts decided that this gave Smith the prior rights. The Porter Brothers offered Smith $2,500 for the right of way, Harriman purchased it for $3,500. This time the Oregon Trunk called for enforcement of the Canyon Act and another mile was added to the joint trackage. A truce was reached on May 17, 1910 when Hill agreed to build no further south than Bend, and the opposing contractors agreed to cease fire for 999 years. With the worst part of the Deschutes Canyon behind, the Oregon Trunk reached Mecca and rapidly moved toward Madras, where the city declared February 15, 1931 Railroad Day with local dignitaries on hand to preside over a gala celebration. The Oregon Trunk let the contract from Madras to Bend, and to hold the right of way, kept men at work on the approaches to the 350 foot long Crooked River Bridge, which towered 320 feet above the water. The DesChutes had not progressed beyond Culver where the two systems ran parallel and not more than 100 feet apart. The first agreement giving Harriman entrance to Redmond on joint track from Metolius was amended on September 6, 1911 to provide joint trackage to Bend with joint terminal facilities. Hey look! Our historic train station! 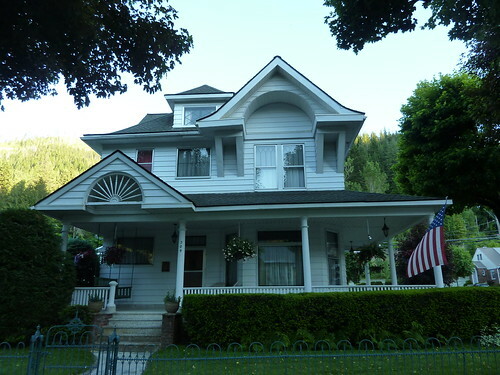 The one we almost sold to Prineville for no apparent reason. 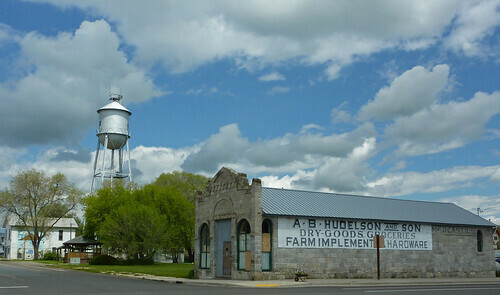 Yea Bend, hi-5 for historic preservation! So, that’s how the train got to Bend. No orderly and organized building of lines, but a bloody brawl for every mile. 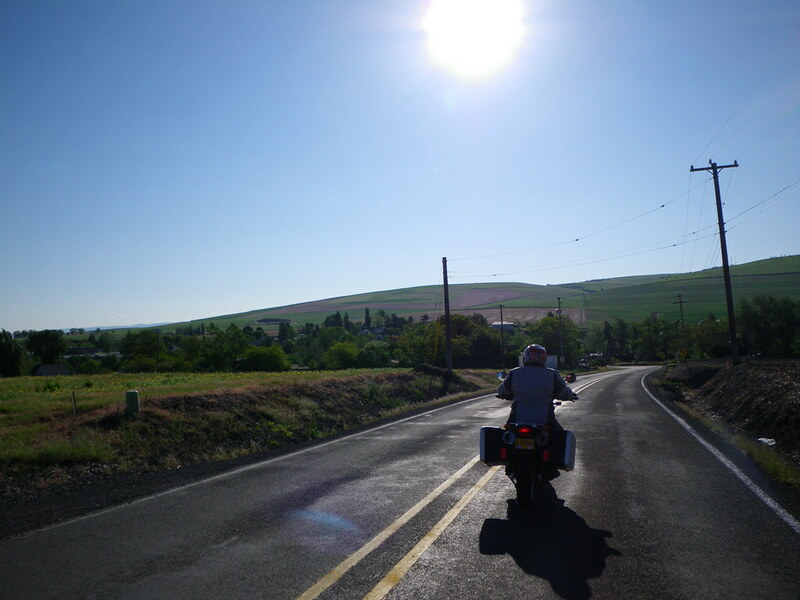 For a first ride of the season, it was no baby step, clocking in at around 375 miles, we were both a little saddle sore by the time we pulled back into the shop this evening. We did see some gorgeous scenery, got to ride a few new miles of single-track pavement, and spent a little time exploring Twickenham School, built in 1906. 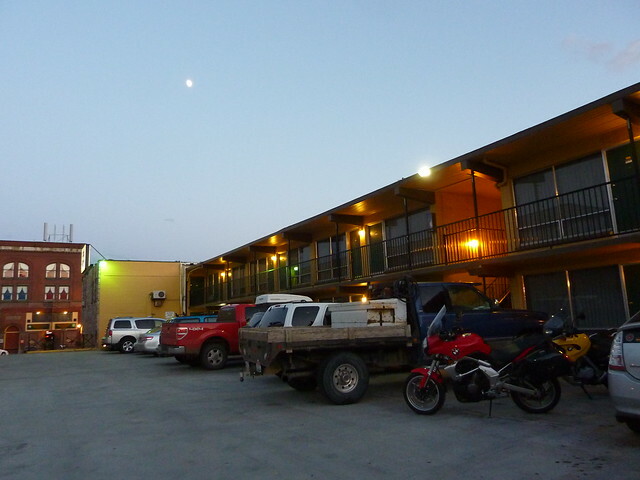 Mike got away from work early enough Friday evening that we were able to make it to an old Motel in Hermiston. Got up this morning and flew across the flats and into the mountains of Idaho’s Panhandle. 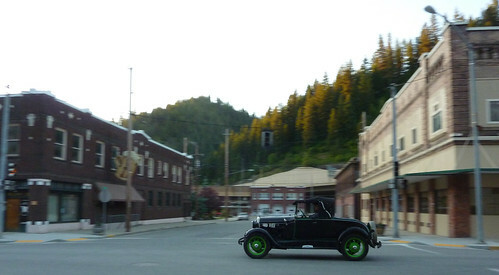 There’s silver and gold in these hills, and old mining towns galore. 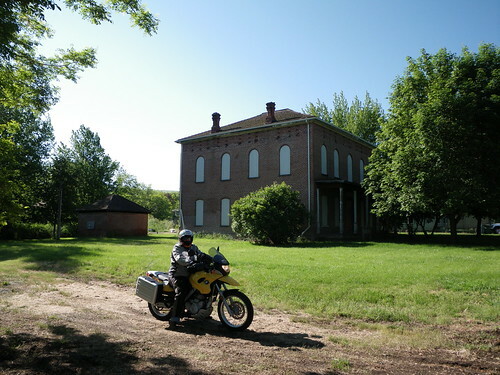 We rode through this area a few years ago on our way up to Newfoundland, glancing off the freeway, doing 80mph and passing semis on the steep grade, we were both intrigued to see the old brick structures and decidedly vintage homes on the very steep hillsides. I remembered the town name and filed it away for a possible future visit. Then last year I read an incredible book, The Big Burn, by Tim Egan, which chronicles a massive forest fire in 1910 that burned 3 million acres, and decimated Wallace and its residents. The opening chapter of the book is still so vivid in my mind, creating images of a roaring wildfire whipped by 70+ mph winds, whipping over the ridge above the town, and swooping down on the residents and the one train that will take them to safety. Really worth reading, especially if you are planning a trip to the area. 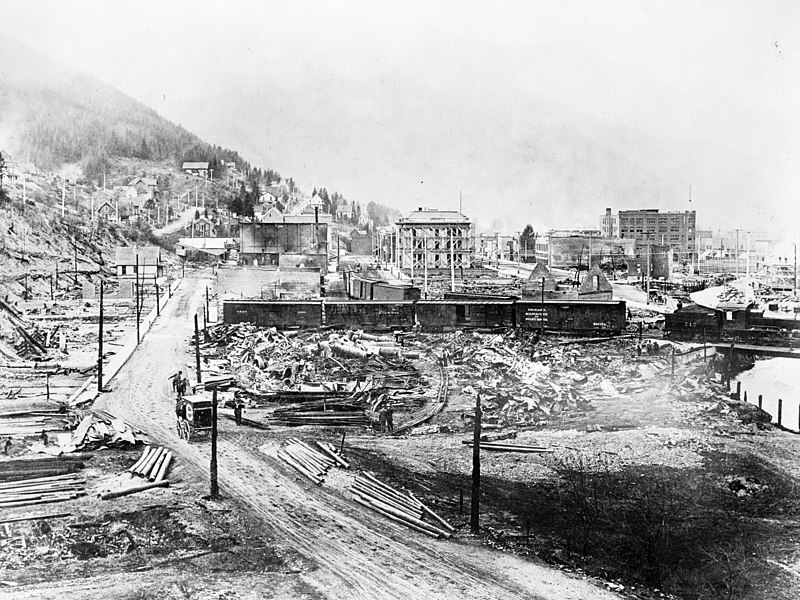 Although the fire wiped out about 1/3rd of the town, many of the original buildings are left. And what buildings they are! 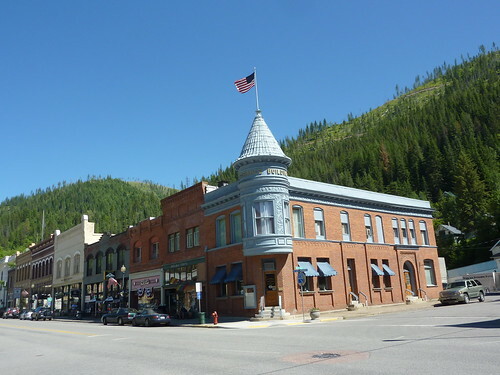 At the turn of the last century, Wallace was one of the richest cities in the west, producing more than a billion ounces of silver by the 1980’s. So, there was some money here, and plenty of it was spent on beautiful homes and business establishments. 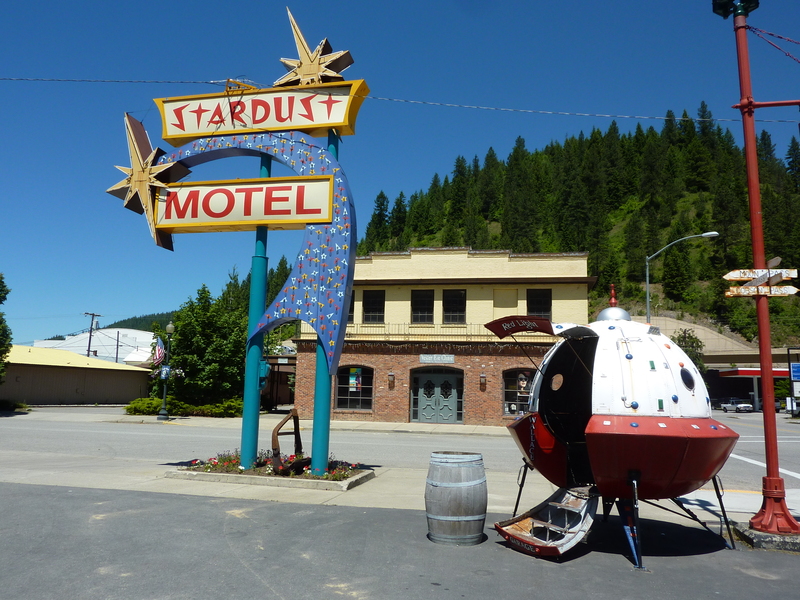 We arrived in town around 11am, and pulled into our motel, the Stardust. Stardust Motel Sign, with accompanying "escape pod"
The gal at the desk was very accommodating, juggling things around to get us a first floor room, then asking the maid to clean it right away so we could get in early. The maid happily dragged her cart from a completely different section of the hotel, cleaned the room in 20 minutes and we were in. Unfortunately, there was no refrigerator, we asked a guy who was fixing a lock on the room next to us if the other rooms had a fridge, he said yes. He talked to the desk clerk, who said our room was one of the few without, and so he simply unplugged the fridge from the room he was working in, and lugged it to our room! Turns out the “maintenance man” was actually Scott Lasley, the president of the Wallace Chamber of Commerce! He made sure we had a local map and tour book, and said to just ask if we needed anything else. Wow! We’re in town for 20 minutes and already we’ve been treated like royalty! Turns out everyone we met here was just as friendly and accommodating. I can’t say enough nice things about the people here. Just amazing. 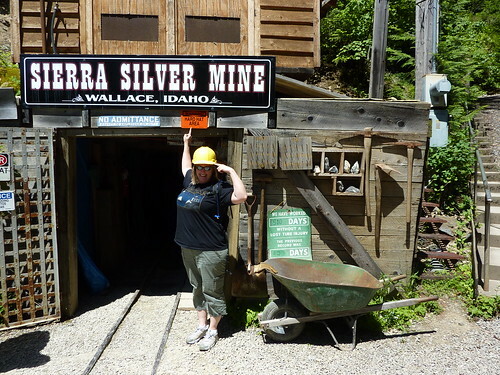 We hiked a few blocks down to the Sierra Silver Mine Tour building, and purchased tickets for the tour. I was hoping to also do the Burke tour, but missed out on the season opening by a few days. 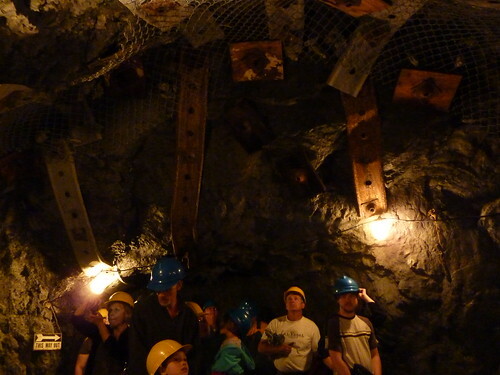 We didn’t really know what to expect from the Mine tour, only that we’d be taking a trolley (with some color commentary by the driver) up to an old mine, then be taken underground by a “real miner” and shown some mine operations. This description makes it sound a bit cheesy, but the tour is really quite amazing and a little dangerous. Our mine guide was tall, gangly and a bit rough around the edges, probably about our age, and he’d been mining off and on his entire working life. Articulate, and very good at creating a word picture of what mining was like “back in the day”, and what it was like for miners today. Amazingly, he demonstrated mine equipment including a drill, a drag instrument, and a loader, all of which were of course, loud, and astonishingly evil-acting pieces of pneumatic machinery which could maim or kill you in a variety of ways. 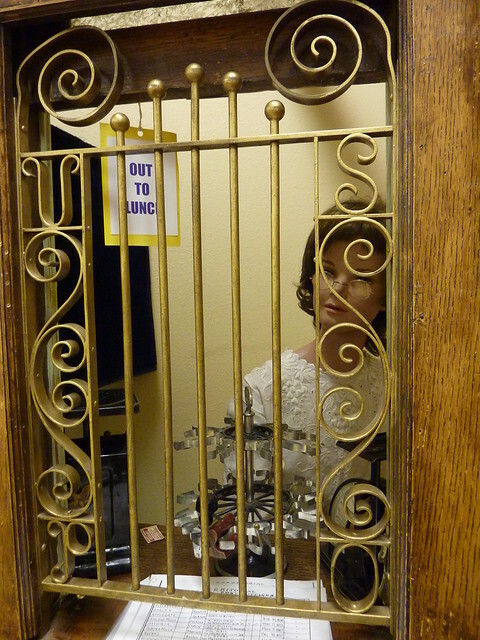 After the Mine tour, we wandered around town, taking pictures and checking out antique stores. 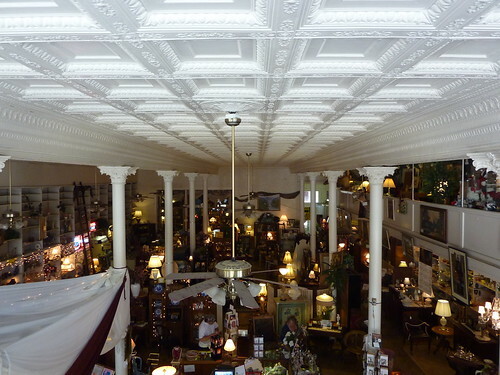 Wallace has done a great job of showcasing the old while allowing new businesses to survive. I was very surprised at how quiet it was for a 3-day weekend, I really expected the place to be packed. I know that during the ATV jamboree it’s a madhouse, and I hope they get enough tourists during the rest of the year to keep things going. I can’t express enough how nice the people are here, everyone, at every store, went out of their way to make sure we had a great time during our visit. 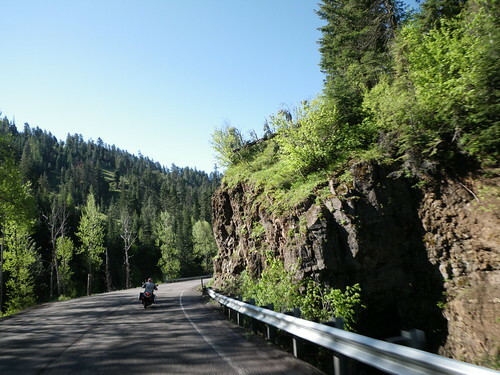 Whether you are interested in history, love riding high mountain ATV and MC trails, or just enjoy wandering antique stores, go to Wallace, you’ll have a great time, guaranteed! For us history buffs, Wallace has put out a great booklet with maps and descriptions of every historic building in town. It’s broken up by residential and business districts, and is very easy to follow. A huge asset, and it made our visit even more interesting. As evening approached, our grumbling stomachs forced us to turn in to the Pizza Factory for their salad bar and some garlic breadsticks. After a filling meal, we headed back towards our room, on the way “home” this little sweetie rolled past, fitting cap to a great day in Wallace. Back in our room at the Stardust, tired feet, tired bodies, comfy bed, ready for some sleep! Saturday evening we got out the map to see what looked interesting on the loop back home. 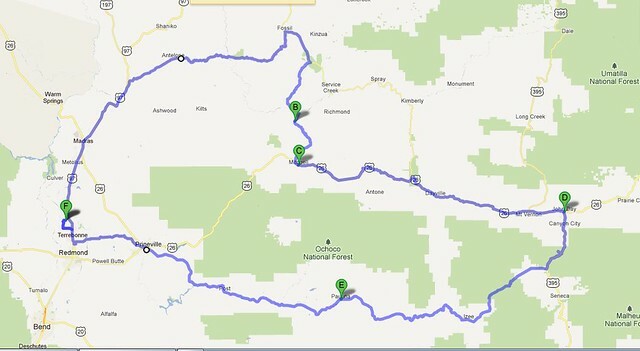 Mike’s motto is to never backtrack, so whatever we did, we’d at least cover different terrain than our ride in yesterday. My only goal was to spend time walking around Union and seeing their Hotel. After checking out some information online, we decided to check out Weston (near Athena – the birthplace of Hodaka motorcycles!) 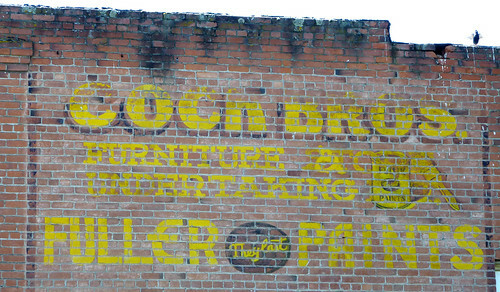 which was another pioneer town with a brick-faced downtown. Weston is another cute little town with more past than present. I spent a bunch of time trying to dig up info, and compiled it here. A note to any historic society in small towns across the country – if you want people to come look at your historic downtown area, have a downloadable map of the area available on your Chamber of Commerce website. It would honestly take someone with a tiny bit of skill maybe a couple hours to make and it would really generate so much more interest in your town! Anyway, off my bully pulpit and back on the bike! 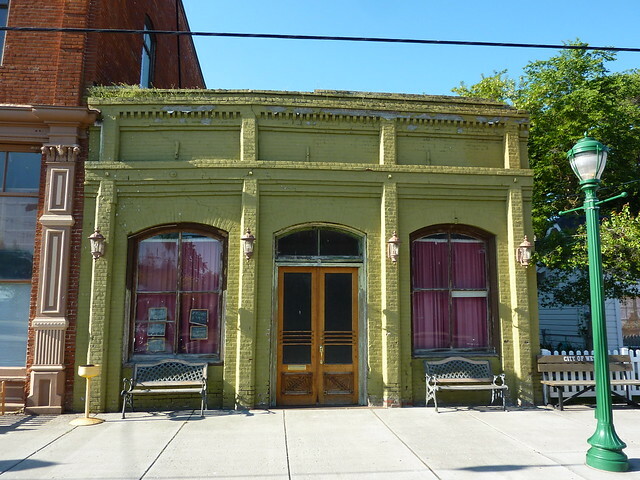 Weston is indeed worth a stop, with plenty of neat old buildings in the quiet downtown, and some older homes interspersed with new in the outlying areas. Cafe is closed. I think this is the worst thing about the economy, little places like this don't stand a chance. Isham Saling House - This really should be a museum! 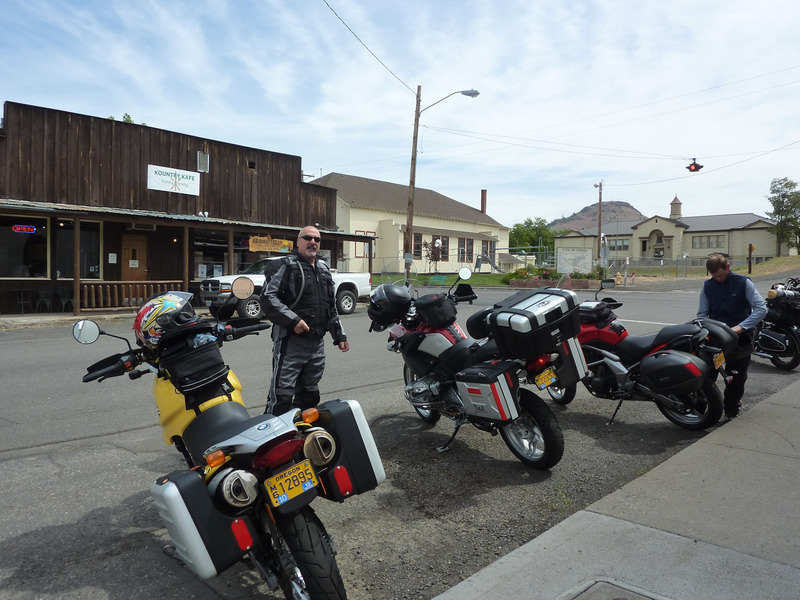 I’d been wanting to spend some time wandering around Union, ever since we stopped here for lunch with our riding buddies a few years back. As we pulled into town, Mike suddenly veered off the Main street and onto a side road, stopping in front of a yard sale. Uh oh. Well, how bad could it be, we’re on bikes, it’s not like he’s going to buy something big, right? Nope, but he did spot this stylin’ helmet, and once we found out it would fit in his side bag, he worked the owner down to five bucks and he was the proud owner of this 1970’s monstrosity. 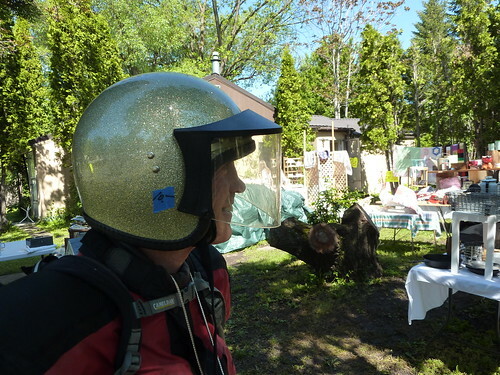 The ultimate buddy helmet - you'd really have to want to ride to wear this! 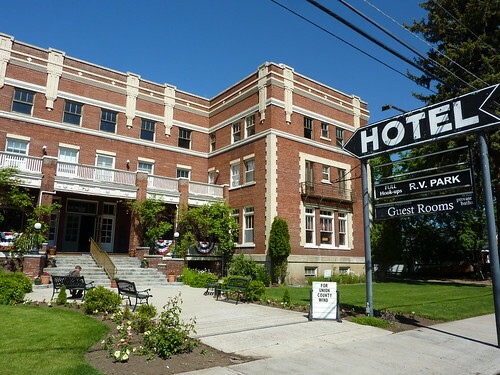 The town has an interesting history, and it was so neat to see the old hotel up and running as a B&B. I’d tried to get a room here (great prices! 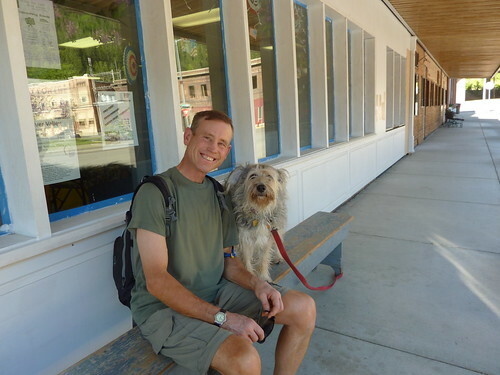 ), but they were completely booked, so we had to settle with wandering around and talking to the informative and humorous owner. Furniture and Undertaking. I can see how these go together, sort of. I'm wondering what prompted this sign facing the creek. 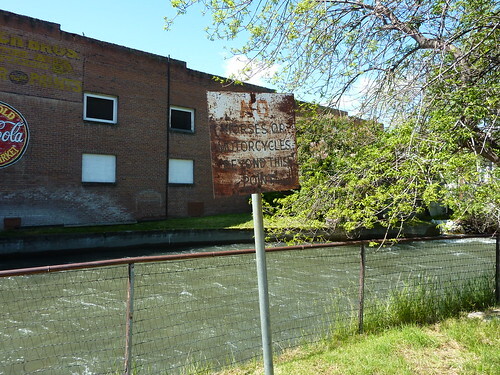 Did they really have trouble with wayward horses and radical bikers floating the river? After wandering around town for a few hours, it was getting late, and time to head for home. Well, I thought it was time to head for home, Mike found another antique store in North Powder, it was closed, but a quick phone call to the owner brought her down from her house behind the shop, and we had a great time wandering through her stuff and talking about various fun places we’d seen on our travels. The rest of the ride home was beautiful and quiet. 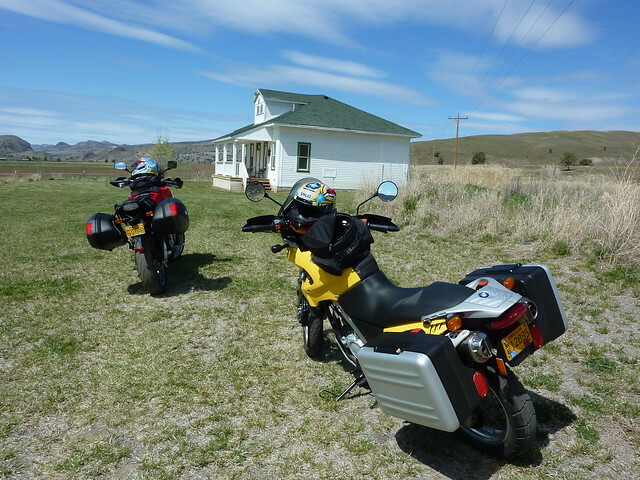 We stopped at our favorite restaurant in John Day for a late lunch (awesome salads!) and got on the bikes for the last leg of the trip. 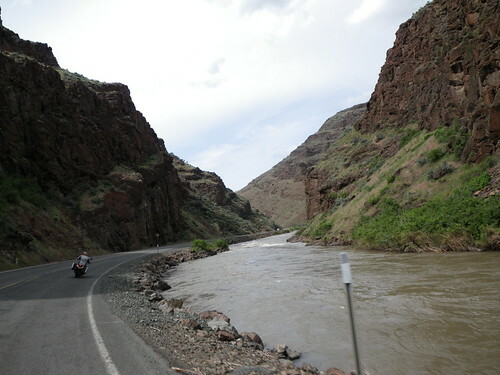 It was amazing to ride through Picture Gorge with the river so high. 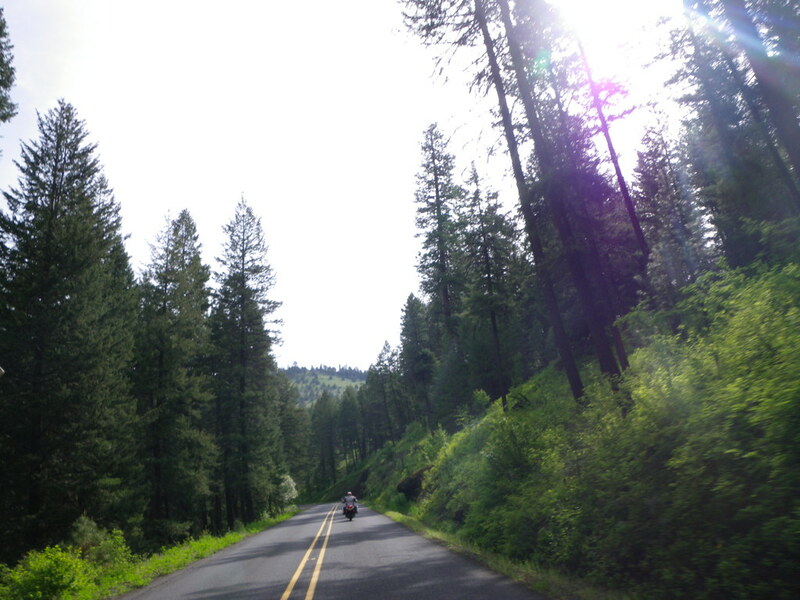 Highway 26, with little traffic on a Sunday afternoon is about the best way to finish a weekend-long ride. So, I’m sure every Oregonian has spent at least one weekend of their lives at the Pendleton Roundup, it’s just part of growing up in the Beaver state (or Duck state, depending on what side of the Civil War you’re on). 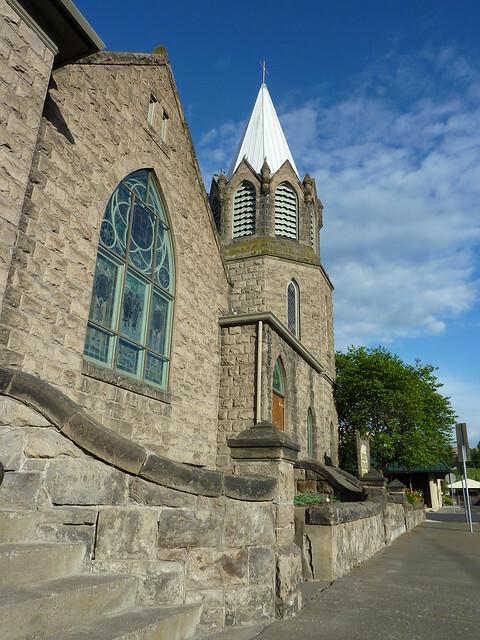 Waaaay back in the 1990’s, we stopped here with Don and Tammy Hoxie on an Eastern Oregon Road trip, hung out downtown and did the Cozy Girls tour. Nearly 20 years later, I thought it might be time for a revisit, especially now that we’re more interested in history and have a longer attention span (but shorter memory!). 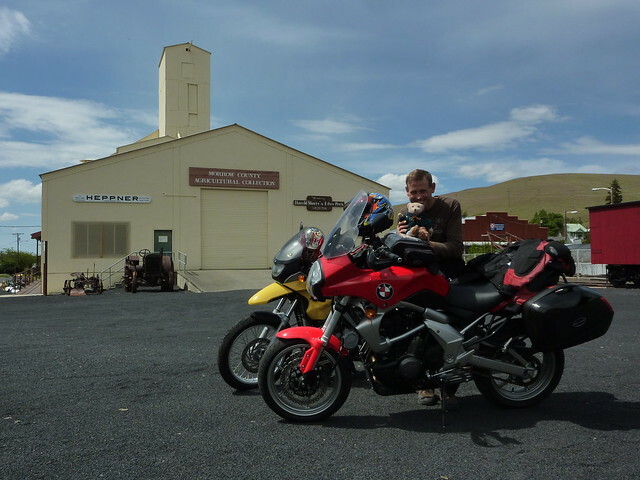 Adding to the attraction would be a stop in Heppner to visit the museum which is never open when we’re riding through – not that they’re never open, we just ride through at weird times! 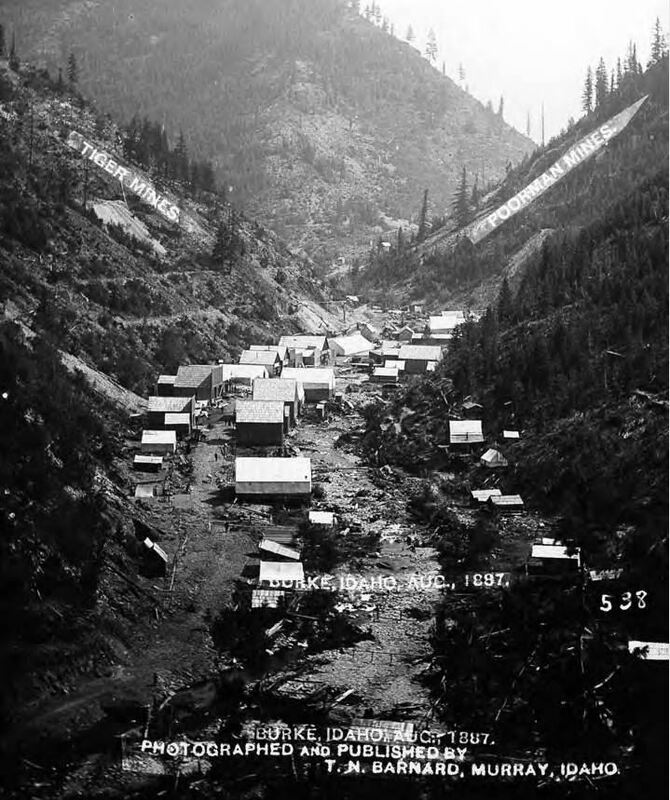 Heppner had a major defining moment in their history back in 1903 a flood raced through town on a lazy Sunday evening, decimating all the low lying areas and killing 247 people. The cemetery on the hill pays mute witness to this event, with many stones showing the same date of death, June 14, 1903. I was looking forward to seeing the museum’s photos history of this event, along with everything else showing the history of the area. 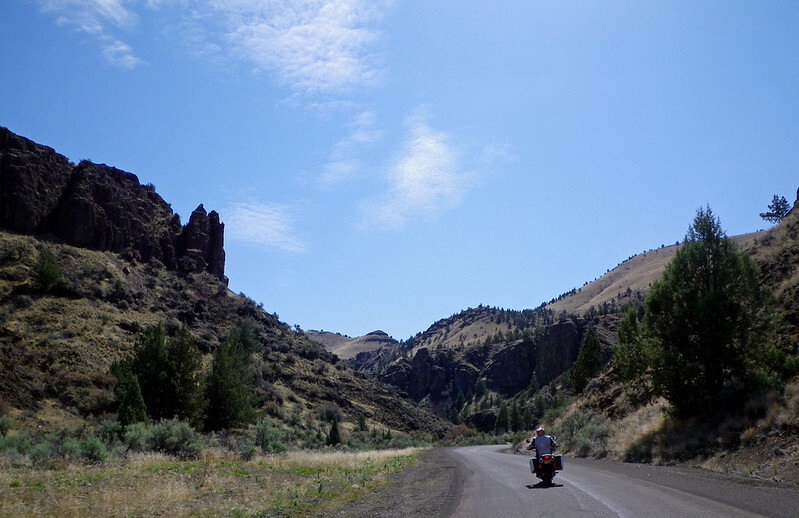 The ride through Fossil to Heppner is one of my favorites in Oregon. 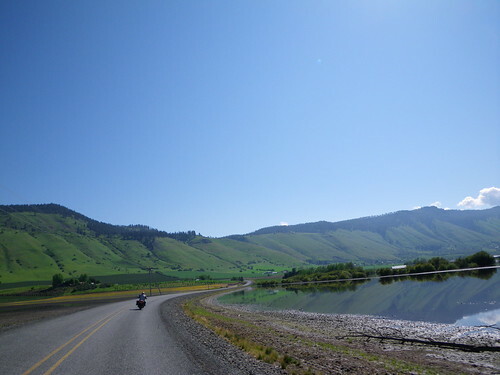 From spring-swollen rivers to wide-open dry wheat fields, it climbs into heavily forested mountains and then dips back down to steep twisty canyons, then follows straight sections through windswept and lonesome plateaus. Really some of the most varied landscape and riding I’ve experienced. But shhhhhh, don’t tell everyone, or it’ll get all crowded and nasty! 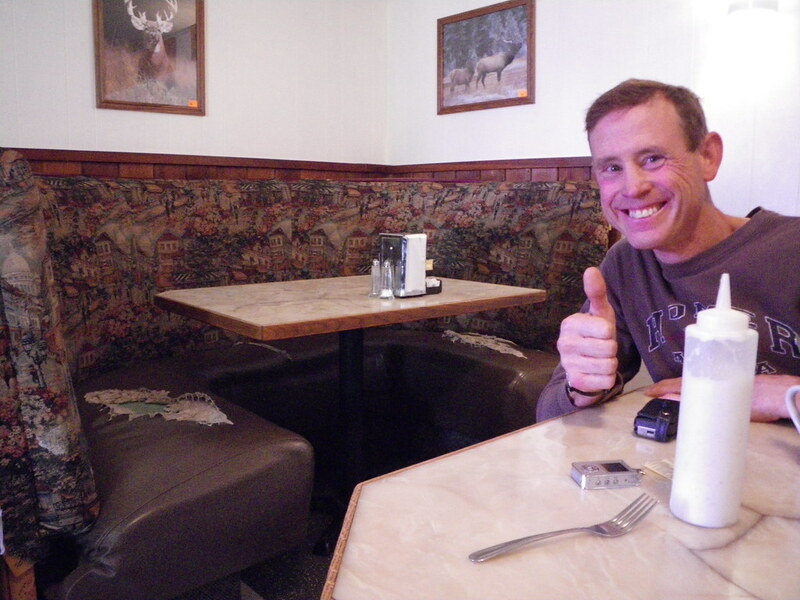 But if you don’t sit in the ripped areas and are careful about leaning back too far on the loose backrest, you’ll be treated to a great meal by a friendly staff. Proves again that looks aren’t everything! The museum looks tiny from the outside, sharing half a municipal building with the library, but inside you find rooms heading off in three different directions, and multitudes of well documented and well-presented neat old stuff! Can you spot the USPO letters in this pic? 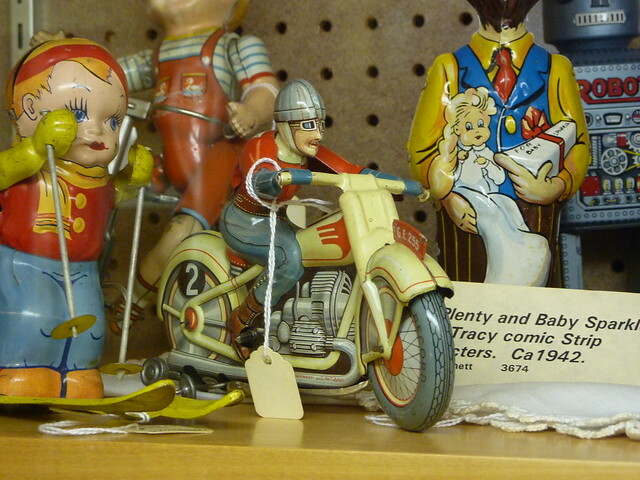 Mike's biggest nightmare - finding a cool vintage motorcycle toy in a Museum instead of an Antique Store! 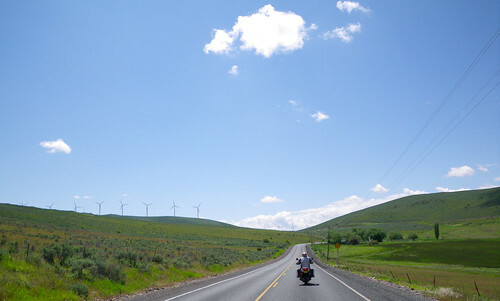 We actually rode through a few sprinkles near Vinson, but by Pendleton it had cleared up and was a beautiful evening. 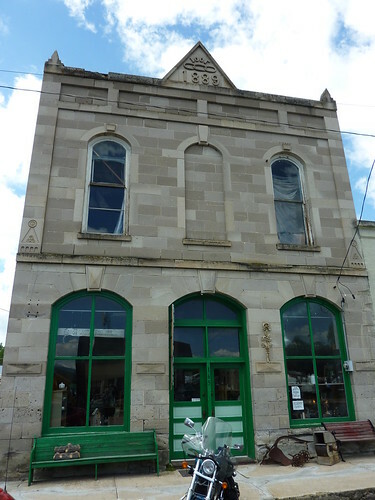 Walking around Pendleton, we found plenty of neat old buildings to gawk at. Unfortunately, it looks like many of them were renovated about 10 years ago, but have deteriorated since, with no money for good upkeep. There’s such a variety of building styles here, it really makes the neighborhoods fun to walk through. Stucco next to Victorian next to brick homestead next to Tudor. Who needs a rodeo when there’s old buildings to see! Amazing what a comma can do for meaning. But maybe they meant what they said? Back in the “Good Old Days” of the soul-crushing Great Depression, the government thought up all sorts of make-work projects. I’m certain many folks thought it was just a waste of money, but instead of just dropping money into a big pit like we seem to these days, they made people earn their wages. The projects created some beautiful public buildings and managed to preserve the history of the “average American” in a way that had never been attempted before. The quote above is from a Mrs. Ford of Portland, telling the story of growing up in Canyon City Oregon. The WPA American Life Histories Project collected hundreds of interviews across the nation, and it’s now all available online http://memory.loc.gov/wpaintro/wpahome.html. 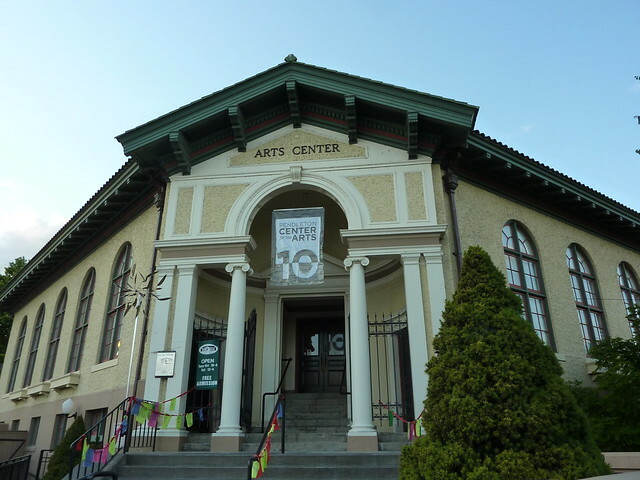 Another incredible site for history buffs is the Oregon Digital Library, which houses a searchable database of collections from all over the state http://odl.library.oregonstate.edu/record/search So many really neat photos and stories here, do a search for Oregon Shakespeare Festival and see photos dating back to the 1930’s. Why is that man in a swimsuit? Or what about the Salem Cherry Festival? There’s photos from the early 1900’s. Getting ready for the 1913 Cherry Festival Parade with the old Capitol building in the background. I could spend days wandering through these sites! How great is it to have all this at our fingertips and not just mouldering away in some library where only a few historians view it every year? Fossil with Bill and Peter – breaking in that new Beemer! We slept in this morning ’till nearly 9am – something we haven’t done for a very long time. I thought we’d get going slowly, take the 650’s front wheel off and drive in to Bend to get the tire changed. The front tire is still the same one that I rode to Newfoundland, unbelievably still holding up and within wear limits. After taking a shower, I came downstairs to hear Mike on the phone talking to Bill – I caught just the tail end of the conversation, but heard “we’ll meet you at 11am”. Hmmm, guess we’re riding! Peter just bought a brand-spankin’ new BMW 1200 GS, and he’s looking forward to putting a few more miles on her. Mike decides to ride the EX500 and I’ll be on my darling Ducati. As we’re getting ready to roll out of the driveway, I notice the EX is a little noisier than I remember and I check the oil window – which is empty. I yell at Mike that I don’t see any oil. We shut ’em down and he runs into the shop and grabs the oil – we do a quick top up and we’re on our way again. Only 1/2 hour late, rats! Sorry guys. After turning off of 97 onto 218, the road is freshly striped with very wide sections of tar. Not a big deal if they’re skinny strips, but it looks like the road department was trying to re-pave the entire section with the stuff. 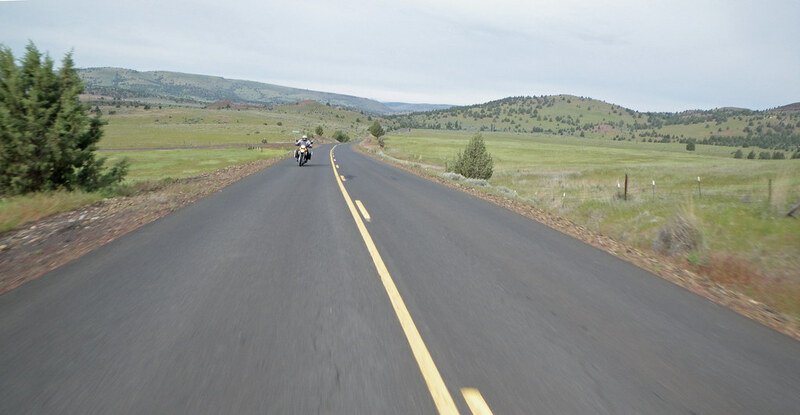 The bike hops, slips and jumps through the first few turns and I’m just hoping the entire highway hasn’t been “fixed”. Fortunately the evil stripes peter out in a few miles and it’s back up to speed. I’m like a neophyte on the Duc, my lean angle is wimpy and I can’t get through my brain how much more agile the Ducati is in the twisties than the Beemer. Slowly I remember my lean lessons and we get going at a little quicker pace. I really need to spend more time with the red bike this summer. Everything is so green! Wildflowers dot the landscape, and all the creeks are exploding beyond their banks, carrying mud and debris with them in a race to the lowlands. It smells so fresh, a mingling of pine, juniper, flowers and warm wet earth. Peter is rockin’ the new ride, which looks gorgeous in all its aluminum-boxed and swiss-army-knife kitted glory. Lunch salads at the Big Timber are great as always. We pick up the tab as a Happy Birthday to Bill, who hit the 6-0 yesterday. After lunch we head to the gas station, which is closed for graduation (they’ll open back up at 4pm), so it’s off on Hwy 207 towards Mitchell. Bill asked me if I remembered where the little old schoolhouse is on this road, and I told him it’s after Service Creek, on the left in a blind sweeper. I said he’d probably pass it and we’d have to turn around. Sure enough, that’s exactly what we do. I’ve always wanted to stop here, but just never taken the time. 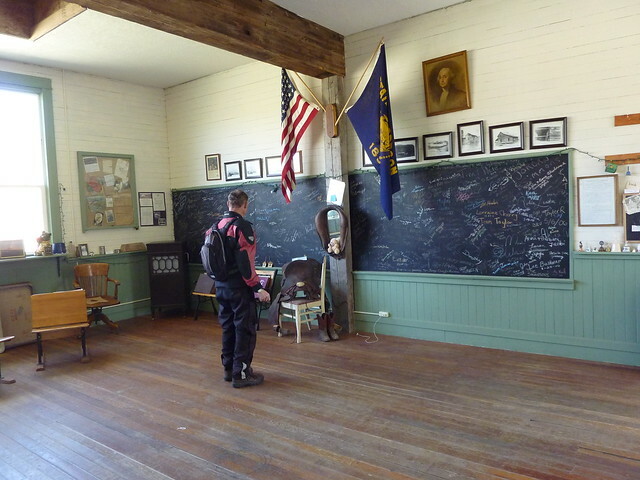 A little one-room schoolhouse at the edge of a wheat field overlooking a small valley. There’s a sign out front, but it’s too old to read from the road. Now we’re stopped we can see it “Waldron School Est 1874”. Surprisingly, the door is open and we’re able to check out the inside. Not much here but dead birds and flies lit by sunlight through the ancient glass window panes. The outhouse is a victim of erosion, falling into the creek bed below. 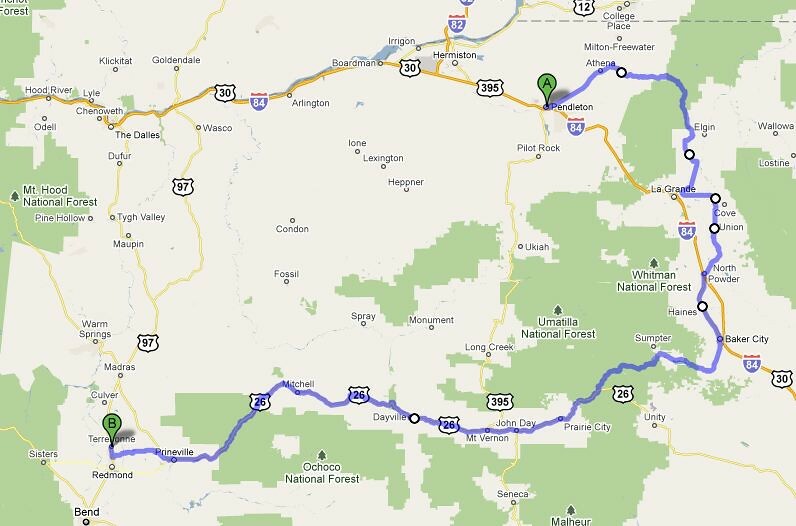 We leave the little school behind and continue in to Mitchell. Henry isn’t hanging out at the gas station any longer, his owner took him up to the house because he wasn’t spending as much time at the gas station as he used to and didn’t want the bear to get lonely and bored (or hungry – that would be bad). Mike finds some kittens and tries to stuff a few in his pockets, but I catch him and make him put them back. Ice cream at the store and we head back home. A fun day, glad we got to help Peter put another 200 miles on the new beastie! 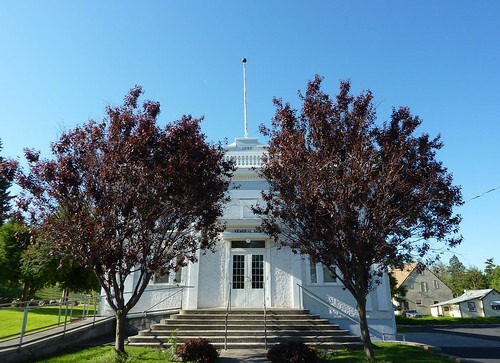 This weekend’s jaunt is to check out historic Jacksonville near Medford, then through Klamath Falls and a stop at Collier State Park on Sunday. Weather was gorgeous on Saturday, although a little nippy in the morning. We dawdled a bit getting going, 23 degrees is chilly, even with heated gear! By the time we got on the road around 9am, it had warmed up to the 30’s and was perfect with our heated gear. We stopped at Shilo Inn in Medford to see if our room was ready yet, no go, so we stripped off our cold weather gear and headed the 4 miles into Jacksonville in balmy 70 degree weather. Jacksonville was started in 1851 with the discovery of gold in Rich Gulch. 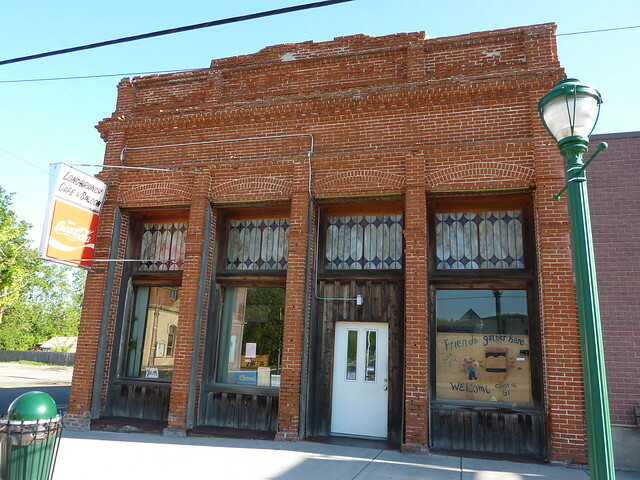 The town’s brick buildings (installed as an answer to the many fires they experienced with the previous wood-frame structures) are very reminiscent of similar gold rush ghost towns on California’s hwy 49. The town survived the fires and lack of any real gold money by becoming a well-known center of trade for the area. The advent of the railroad in Oregon was exciting for Jacksonville, until they realized the trains would bypass this hilly area, instead using the relative flat valleys through Medford. 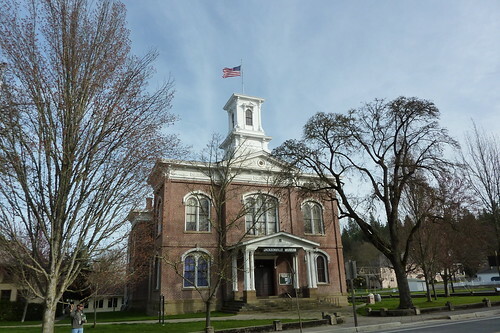 As Medford grew into a booming metropolis, Jacksonville struggled to keep some of its former glory, fighting hard to keep the county seat by building a bigger and more beautiful courthouse, only to have their best-laid plans go to naught. 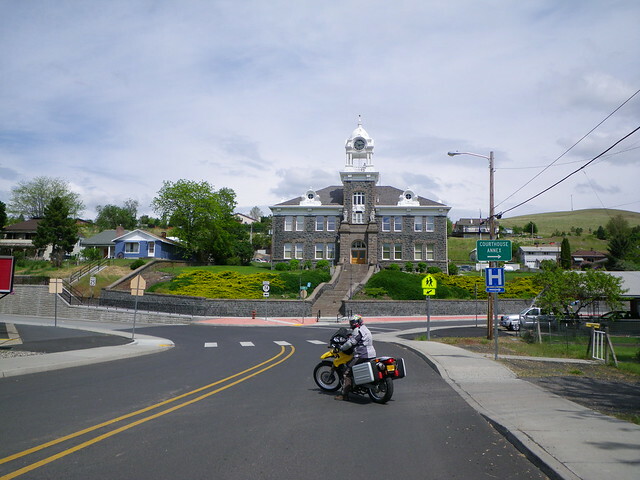 The county seat moved in 1927, and by the 1930’s the few residents still left were digging underneath the town to scrounge what little gold was left. Fortunately, the advent of America’s historic preservation movement interceded in the slow decline, and by the mid 1960’s many groups (including US Bank) were helping keep the history of Jacksonville alive. 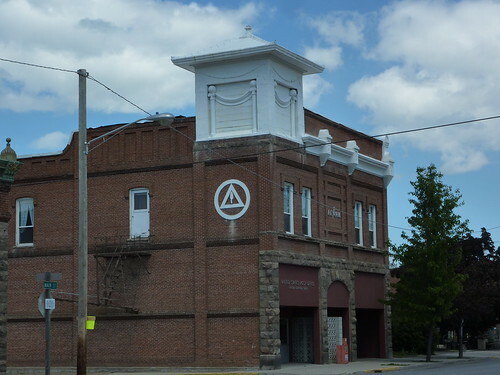 The town is currently suffering from the low end of another boom/bust era, with some newly minted commercial buildings sitting empty and forlorn at the edge of town, and a budget shortfall that has temporarily closed the museums. I’m sure things will turn around soon, and if this weekend’s traffic was any indication, the core of the town is still healthy. If you’ve never saved an mp3 file from the internet, here’s how to do it. Right click on the “download tour” and choose “save link as” then select a location (your documents folder, desktop, wherever you’ll remember it), and click ok. The file will be saved to your computer, then you can load it to your iPod or other mp3 player (put it in the player’s podcast folder so it’s easy to find). Also print off the maps for each of the tours while you’re there. 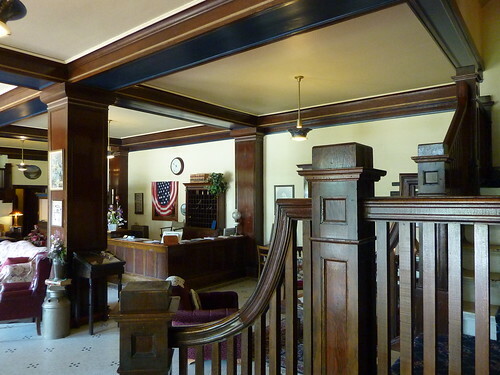 These tours are just like having a personal docent telling you about the town, its people, and its buildings. A great way to learn! I wish more places did this, it’s a super idea. After spending hours in town, we headed up the hill to the cemetery. 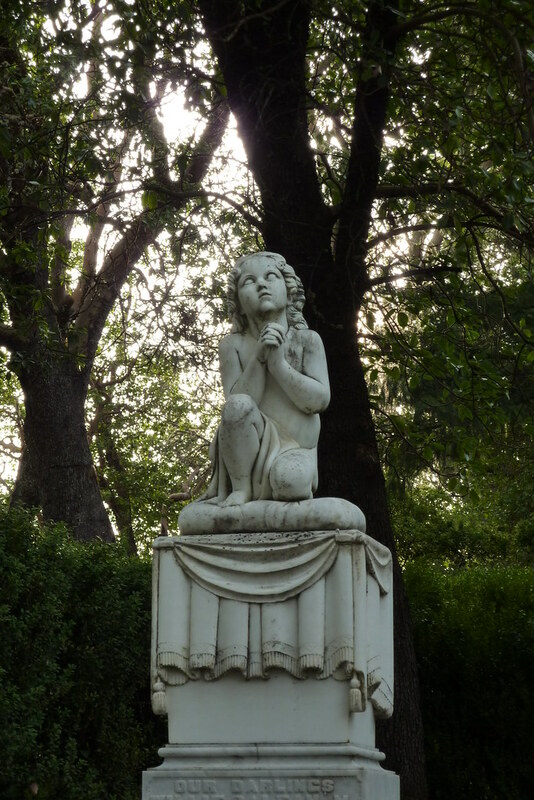 Mike’s not a big fan of hanging out with deceased folks, but this is the most amazing cemetery, and we enjoyed nearly two hours exploring the beautiful grounds and listening to the stories of the people. You can’t help but be affected by the place. Life was so heartrendingly hard, but people persevered. Simple things we take for granted brought immeasurable hardship to settlers in the 1800’s, but instead of making them trudge through life, they created beauty and art. Tombstones lovingly created with hours of toil live today as a testament to how strong these people really were. I am such a soft, spineless, and whiny fool compared to even the weakest of these souls! After a good night’s sleep at Shilo, we woke up to wet roads and a light rain. Not in the forecast, but still no big deal. I can’t tell you how much more relaxing it is to have heated gear and not worry about this stuff! We got going by 8am, and pulled into Collier State Park a little before noon. One other car in the parking lot left just as we were eating some food and checking out the map, so we were all alone with the big trees and antique logging equipment. Halfway through our tour, the rain started to come down, but with our riding gear we stayed warm and dry. Hearing the rain fall and the absolute quiet of this place was so beautiful. The equipment is massive and truly impressive to see, definitely worth stopping! 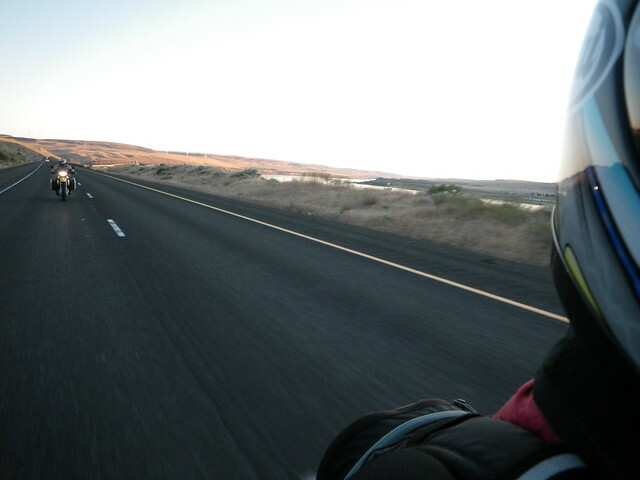 This was also the inaugural trip for Mike’s new camera, an Optio W80, which is waterproof and cold resistant – perfect for hanging around his neck and snapping shots while riding. I’m happy with the photo quality, very similar to what we were getting from the Canon SD10 before it died (probably because it wasn’t waterproof and we got it pretty wet! ).